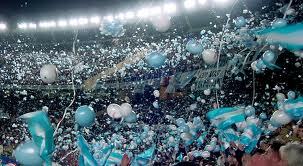 Buenos Aires is a dream city for any avid football fan with the majority of top flight teams found within the city and so living here has provided me with the opportunity to watch and experience much of the exciting local football! The purpose of this blog is to allow football fans from around the world keep up to date with one of the greatest leagues. Every weekend the site will be updated with the latest scores and tables but will also attempt to keep on top of any latest news. Please feel free to comment on the site or send an email. If you have questions or a suggestion for future posts then let me know!